Jesus Christ established the new covenant to save all people 2,000 years ago. However, the truth was ruined and the way of salvation was lost. So, Christ had to put on the flesh, the clothes of thorns, once again. The year 2018 marks the 100th anniversary of Christ Ahnsahnghong’s coming to the earth a second time to restore the new covenant as it was prophesied in the Bible. The New Jerusalem Preaching Festival has begun to make this year more meaningful and to realize the noble will of Christ Ahnsahnghong who preached the good news of the kingdom with love and sacrifice. On November 20, the Church of God members all around the world made a firm determination to accomplish the mission to preach to seven billion people at the preaching festival launching ceremony held by nation and region. Mother opened the way of blessings through prayer during the service for the launching ceremony at the New Jerusalem Pangyo Temple in Korea: “Let us deeply understand the love of Father who did not avoid suffering to save His children and follow His life.” Mother also prayed that Father’s wish to deliver the truth of life to the whole world would be realized through the preaching festival. “Father wanted all people to receive Heavenly Mother, the reality of the new covenant, and be saved. 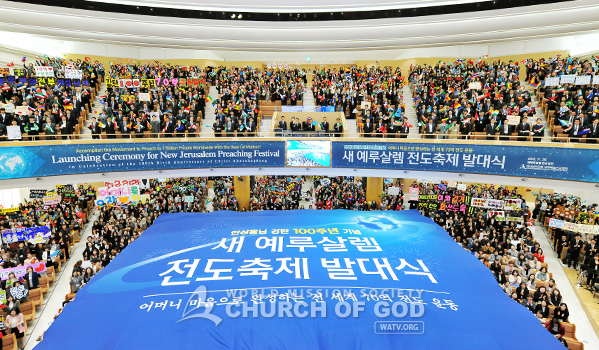 To make disciples of all nations and teach them to obey everything God has commanded us, we should preach the gospel loudly in unison, as those who’ve realized the truth first,” said General Pastor Kim Joo-cheol, stating the purpose of the preaching festival and emphasizing the importance of unity repeatedly. “Let’s take the preaching festival as an opportunity to complete the gospel work. Let’s devote ourselves wholly to the gospel work with 100% faith and finish the 100th anniversary year of Father’s birth with a grand finale of abundant good fruits,” he said (Mt 28: 19–20). After the service, the members watched a video which showed that the new covenant truth spreads to all corners of the earth and that the members’ constant volunteer services and good deeds around the world display the glory of Jerusalem. Confirming the fulfillment of the prophecies (Mic 4:1–2; Isa 60:3), the members began the launching ceremony with more fervor. Mother proclaimed the start of the preaching festival, expressing Her wish that it would become a happy festival when all people around the world receive blessings through the children who follow the gospel path of Father. Afterwards, General Pastor Kim Joo-cheol read aloud with the members the resolution that they would change in accordance with the will of God, display the glory of Father and Mother, resemble God who regards one soul as more precious than the entire world, and participate in the preaching festival with the mind of the Good Samaritan. They determined also to complete the mission to preach to seven billion people with unity and prayer that pleases God. The launching ceremony ended with singing a New Song in unison and chanting a slogan, which expressed their will. Mother thanked all the children for their participation in the preaching festival with one mind. “Prophecies are being fulfilled rapidly. God said, ‘According to your faith, will it be done to you.’ Let’s have faith to complete the gospel work and do our best,” Mother asked them and gave blessings again. A streak of light shone at the ends of the earth in the east by Christ Ahnsahnghong has illuminated 175 countries until now in 2018. The time has come for the light to shine in all seven billion people throughout the world. The door of the festival to accomplish the prophecies has opened wide.